All nature is yours, O One in All. You command it, observe it and pervade within it. Spending time in nature can help us detach themselves from the materialism and greed that surrounds us. For anyone looking to avoid the Five Thieves, this is an important lesson. Communing with nature is one of the best ways to understand our own place in the living web that is the world. It can also benefit our health, giving us longer and more fulfilling lives. Coming closer to nature can help us to understand creation, which as Gurbani teaches us, is the essence of God itself. In a world in which mental health is fast deteriorating a walk in the woods is good way to restore our own sanity and help re-sort our priorities. listening to natural sounds can reduce stress and mental fatigue, and it's a practice that's been used by students and academics for years. But simulating natural sounds doesn't have the same effect that experiencing them first hand does. Daily outdoor activity and exploration of nature are directly tied to longer lifespans and more fulfilling existences. Natural retreats are nothing new, so if you're feeling fatigued or burdened by societal expectations, consider packing a bit of gear gear and taking a hike around the countryside alone or with ones you love. It's important to separate yourself from social engagement and the everyday games of greed and your ego. When we do this regularly it improves the quality of our work, and are less likely to react poorly to unexpected circumstances and experiences. This can improve your relationships when you return home as well as the calming effects carry over into our daily lives and affects what we think about and what we say. aapay beej aapay hee khaahu. You shall harvest what you plant. 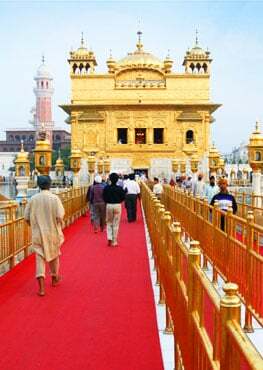 O Nanak, by the Hukam of God's Command, we come and go in reincarnation. This principle can be seen in nature, as we watch trees grow again in a forest ravaged by fire, and witness animals like deer develop skills to, in turn, kill the predators that hunt them in self-defense. This is as true in our daily lives as it is in nature, but those who camp and hike often testify to being more aware of the consequences of their own actions, because they've seen this proof in nature. I hope this little article has made you consider stepping outside and involving yourself in more outdoor activities. It has beneficial effects on our health and longevity, but it can also be a teaching experience. Growth and creation, the cycle of birth, desire and death are all more apparent in nature. It can also improve our mental health and wellness, as well as inspire newfound connection to the One in all things when we feel our selves an active participant in the sacred web of life while enjoying a nice hike or refreshing camping trip.